I used to live outside of Dallas in a neighborhood that was completely overrun by bunnies. They were all over the place…. eating our flower beds, tormenting our dogs, and nearly scaring the life out of me. Have you ever started digging in a flowerbed only to have 3 baby bunnies jump out at you? The little furry creatures can be a bit of a nuisance at times, but their cuteness always brings a smile to my face…even when I’m running down the middle of the street trying to catch them so that I can stuff them back in their nest. Kids can create cute bunny bags to house some Easter-themed treats. Let them cut out the ears to get some practice with their scissor skills. Provide them with a tray of materials to create an open-ended creative activity. 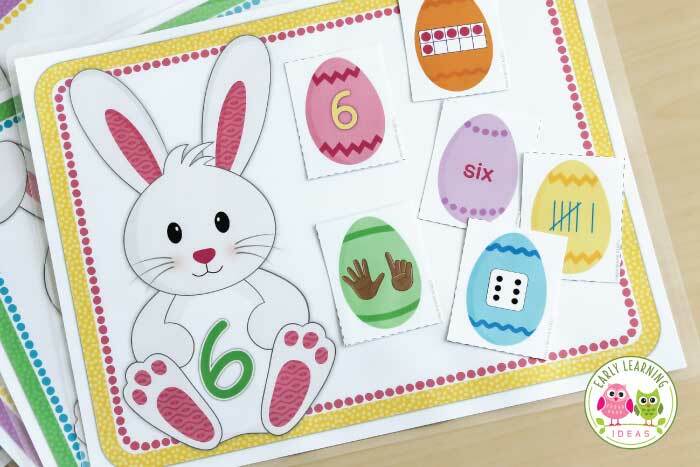 These cute bunny math activities can be found in my store. 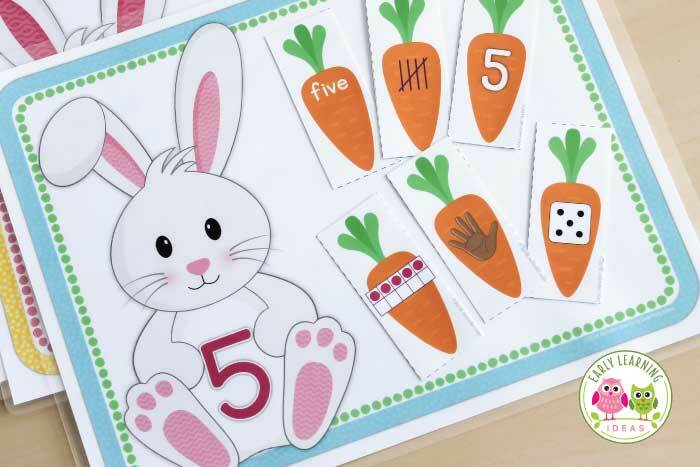 Kids can use the printable carrots to practice counting or composing and decomposing numbers. Provide some orange playdough and they can make their own carrots. The set includes ten frame, finger counting, dice, numeral, tally mark, and number word cards so that kids can learn to represent a number in many different ways. Want to make it an Easter-themed activity? There are Easter Egg cards that you can use instead of carrot cards. You can even incorporate the bunny theme into your snack time. 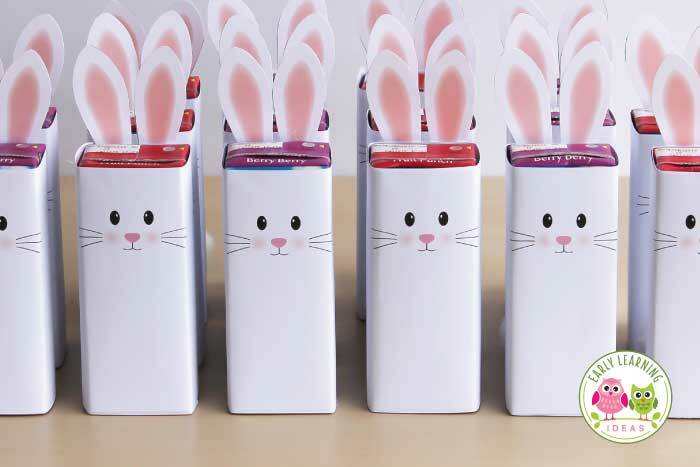 Use my free printable to make some bunny juice boxes for your kids. One of my favorite rhyming books is Rhyming Dust Bunnies by Jan Thomas. 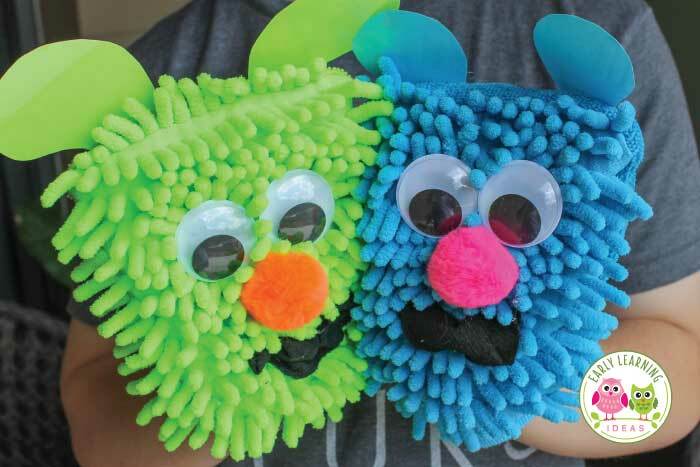 Make some rhyming dust bunny puppets to go with the book. Here is another activity that is available in my store. I had so much fun creating this bunny sorting activity. Kids can sort the bunnies by size, color, and style (see the design on each bunny?). The bunny activity includes printable tails, but you can also use colored pom-poms. Pull together a bunch of bunny-themed materials to create a playdough tray. Get directions for this fun, textured playdough and material ideas for an Easter bunny playdough invitation to play. 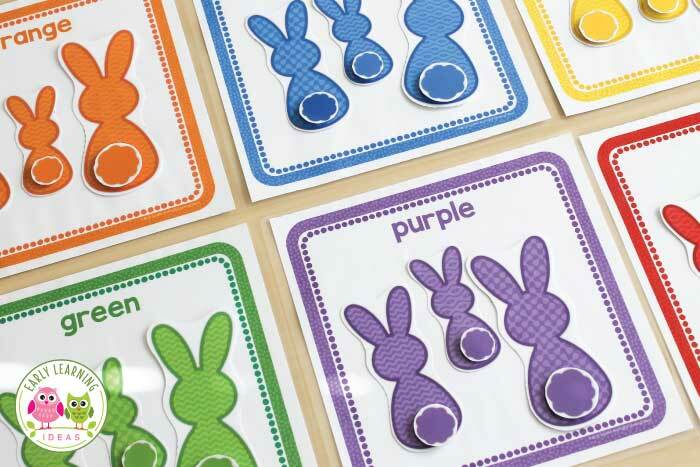 This bunny alphabet matching and beginning sound matching activity can be found in the store. Kids can match uppercase to lowercase letters. The bunny letter cards can also be used with a salt tray to practice letter formation. They can also identify the beginning sounds of objects and match them up to letters. For an additional challenge. Beginning sound cards without word labels are also included in the set. Here are several bunny/rabbit themed books. I really love Muncha! Muncha! Muncha! by Candace Fleming. Kids laugh at the sneaky rabbits and squeal with delight as they recite the repetitive text. It works really well with a garden theme too. The links below are affiliate links. If you happen to purchase something from a link, there will be no additional cost to you, but a small portion of your purchase will be used towards the cost of maintaining this website. I found some Bunny Chants and Rhymes from Teaching Mama that you can use during your circle time. I hope that you found some fun bunny activities that make you smile….just like I do when I see those little bunnies jumping through my yard. Do you have another favorite bunny-themed activity? I would love to hear about it in the comments below.